If I’m not researching how my potential buyer and seller clients are behaving, I’m not sufficiently doing or preparing for my job. 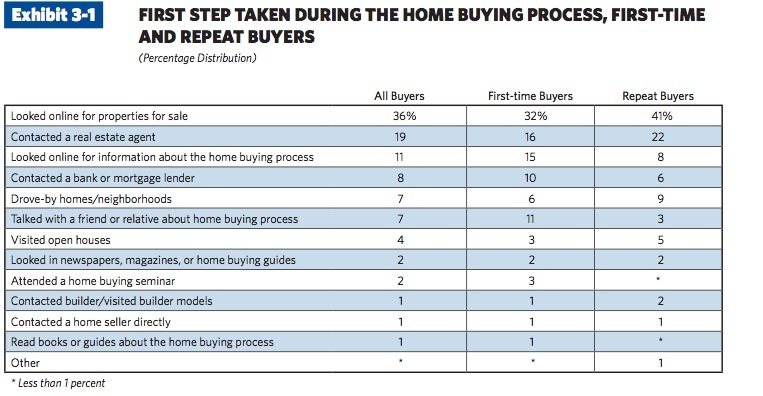 As such, I have been digging into the NAR’s Profile of Home Buyers and Sellers. Expertise is something you must earn again and again, every single day. All charts and data that follow are courtesy the National Association of Realtors’ Profile of Home Buyers and Sellers – 2010, which more than justifies my membership dues. 1 – Begin the buying process in earnest? 2 – Contact an agent, if at all? Pulling highlights out of this comprehensive 124 page report is challenging, but I’m hoping to make time to write a few posts as I make my way through it. The first image below, “Length of Search, by Region” surprised me, not so much by the length of the search itself, but by the delta between 2001 and 2010. 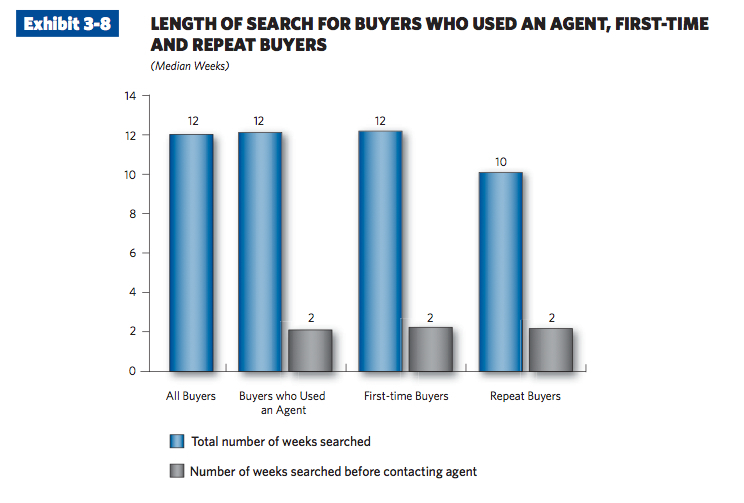 Astonishingly, with so much more information available to consumers, the length of time searching has increased from 7 weeks in 2001 to 12 weeks in 2010. I’m wondering whether paralysis by analysis is a contributing factor to this. The first step in the home buying process: looking online. But a far lesser percentage than I expected. – I presume that the repeat buyers may be those repeat buyer buying within the region they already inhabit; they know where they want to live, so the investigative process is much shorter. 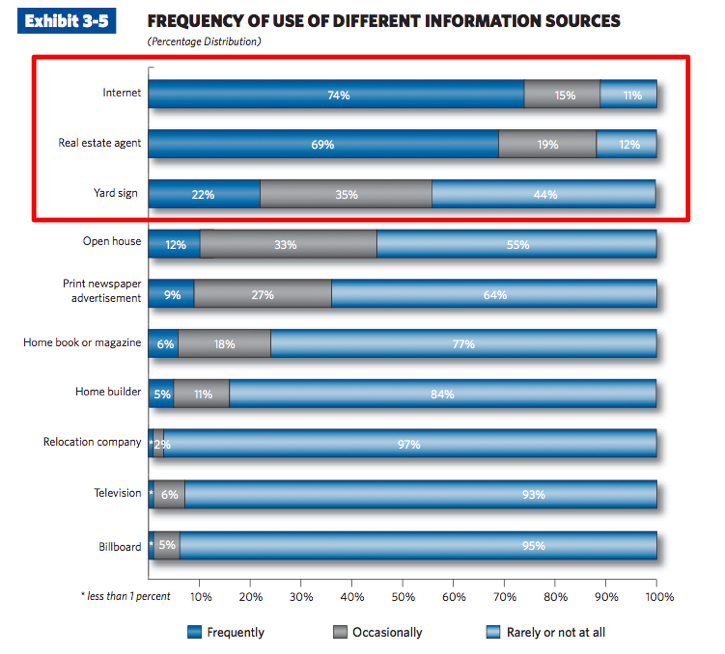 – Same as last year, Internet, Real Estate Agent, Yard Sign are the top three sources. As I wrote last year, Nest’s Priorities Mesh with Charlottesville Buyers and Sellers Needs. – Print newspaper/advertisement and home book or magazine both dropped by the largest percentages. I’m not completely discounting print’s effectiveness; for branding, print is hard to beat, for selling a house, it’s not even in the conversation. 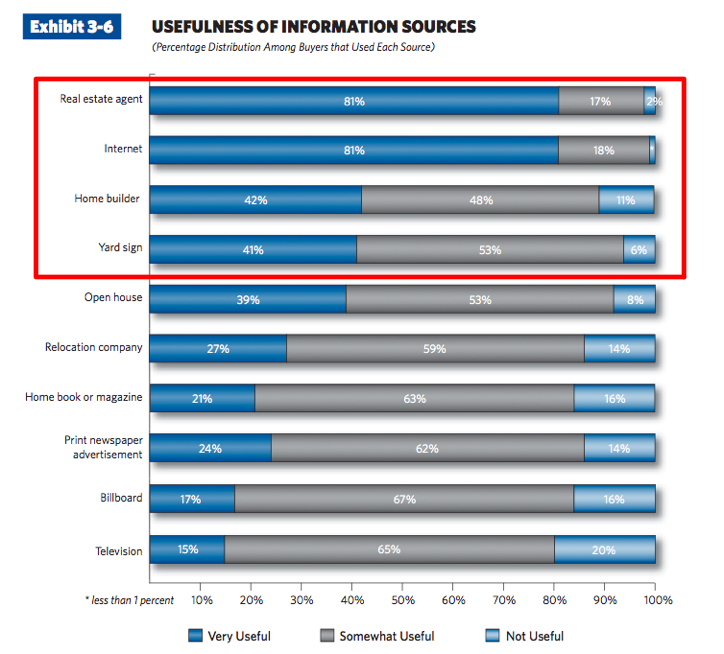 A qualifier to the below chart: Good real estate agents are useful. Agents are good because we are still better interpreters of our clients’ questions, needs and wants than the interwebs. As I said four years ago, Zillow Cannot Adapt; until they develop effective Artificial Intelligence, people will be the best options. No surprises here – the internet is the most frequently used information source; this is one reason that I coach my buyer clients (and any reader, really) in how to effectively search for homes in the Charlottesville area.